I created this ripple after Dawn at the Ripple Along mentioned she wanted one with a solid core rather than the lacy one in my previous pattern. I don't know if this is what she had in mind. This one is easy peasy! I call it the 8 Point Wavy Ripple. I also realized this afternoon after finishing 2 swatches for this ripple that I have spent so much time creating these patterns and swatches that I probably could have finished my first round ripple afghan for the ripple along by now. 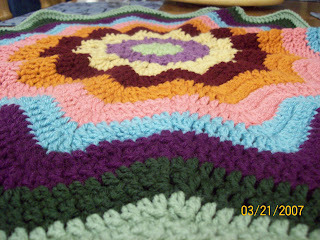 I have pictures of my progress on the second one I started based on my pattern for the Gentle Waves Ripple. Bernie thinks it's too "loud" but he hasn't seen the beautiful ripples everyone is creating for the ripple along. I had to remind him that I am part Filipino and that we're a colorful people! I am not always feeling my color choices but it's really fun to look at. 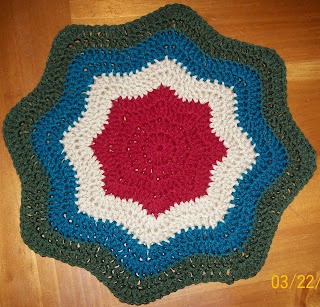 This last picture is the swatch I came up with before settling on the 8 point afghan. I thought it automatically had to have 12 points because that's what I'm currently working on but in order to get the right stitch count to make 12 points I had to have a pretty big center section of increases. I just didn't like the way it looks. It is more round than wavy and didn't ripple enough for my taste. I tried to crochet into the back loops only to try and emphasize the ripple but it just didn't work for me. I realized that the openwork in my original pattern is what helped set up the deep ripple effect. You can really see this when you compare the pictures of all three afghan patterns together. At least we now have options! You are amazing and generous. Thank you for developing these patterns! I just wanted to say that your round ripples are beautiful! And thank you for sharing your designs. I can't wait to try it out. 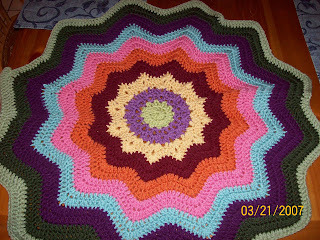 I LOVE making round ripple afghans. I love this 8 point. I have been working on one, but I cannot get it to lay flat or is it suppose to? I'm using red heart yarn super saver and I've tried a G, H & I hook. Any suggestions? I use an I hook and the very center doesn't lie completely flat until I flatten it out with my hands on the floor but you shouldn't have any problem with the successive rounds as long as you alternate the increases to control the rate of increase, which, if you increase too quickly, I don't think it will ever lie flat. I'm also using Red Heart Super Saver and TLC yarns for mine. Thanks for your help! I'm using an I hook and it is working better.The center was what I was concerned with. So I guess I'm doing fine. Thanks!! I've just started the gentle waves, no problems so far. Is there a pattern for the 8 point wavy ripple? If there is, would you please send it to me? 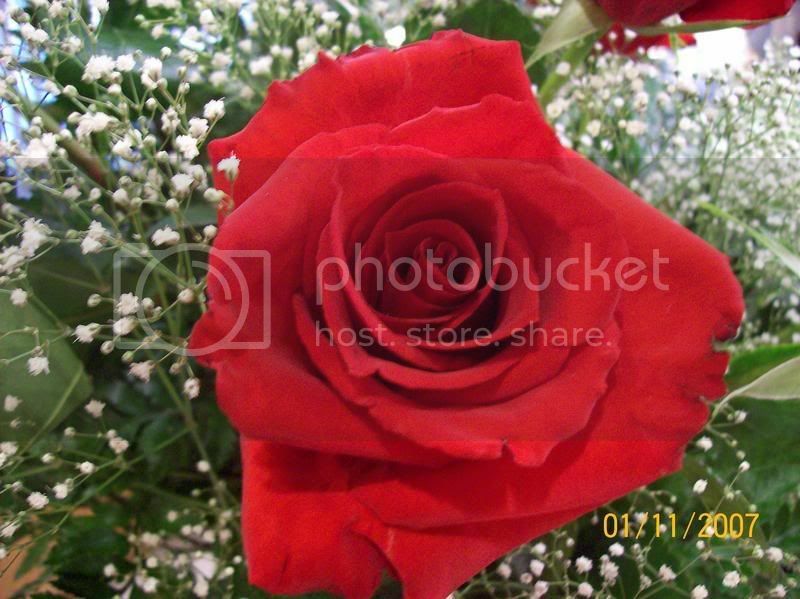 These are beautiful, as are you. Thanks you ever so much. Joyce, after working on this afghan for several rows, I was never able to get the center to lie absolutely flat and didn't want anyone to devote their valuable time (and yarn!) on it and get less than desirable results so I removed the pattern from my blog. Believe me, if I try again and get the results I want, I'll post the pattern. Thanks for asking, though. Stay tuned. Yes, BCSugar, it is a .pdf file on the right sidebar of my blog under My Patterns. It's called Gentle Waves Round Ripple Afghan. Just click on the link. Good luck! Please show me a pic of yours when you're done. 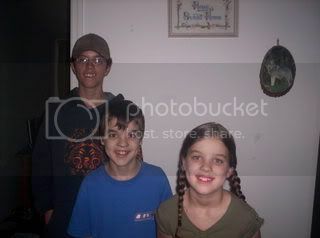 I really like the 12 point in the last picture... I've wanted one with softer points. Did you abandon that patent all together? I would love to make one. I also love the 12 point that doesn't ripple sharply. I've made many round ripples, but this one is the best I've seen. Do you have a pattern for it? Thank you! 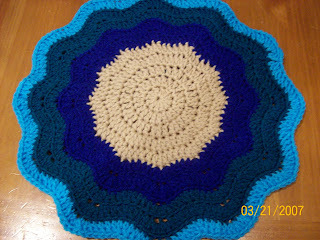 The link to the pattern is on the right sidebar of my blog called Gentle Waves.